Components of a simple water budget for part of a watershed. 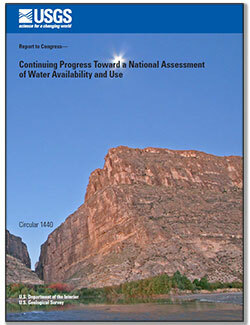 Collaboration is a critical part of the USGS National Water Census. 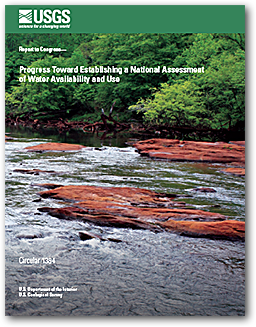 It not only helps direct USGS efforts towards assessments that are most useful for end users – such as other Federal, State, regional, local, and tribal resource managers, but it also ensures that information produced by the USGS can be aggregated and assimilated with other types of physical, social, economic, and environmental data that affect water availability and use. Below are science components of the National Water Census. Alley, William M.; Evenson, Eric J.; Barber, Nancy L.; Bruce, Breton W.; Dennehy, Kevin F.; Freeman, Mary C.; Freeman, Ward O.; Fischer, Jeffrey M.; Hughes, William B.; Kennen, Jonathan G.; Kiang, Julie E.; Maloney, Kelly O.; Musgrove, MaryLynn; Ralston, Barbara E.; Tessler, Steven; Verdin, James P.
Progress toward establishing a national assessment of water availability and use; 2013; CIR; 1384; Alley, William M.; Evenson, Eric J.; Barber, Nancy L.; Bruce, Breton W.; Dennehy, Kevin F.; Freeman, Mary C.; Freeman, Ward O.; Fischer, Jeffrey M.; Hughes, William B.; Kennen, Jonathan G.; Kiang, Julie E.; Maloney, Kelly O.; Musgrove, MaryLynn; Ralston, Barbara; Tessler, Steven; Verdin, James P.
Below are data or web applications associated with the National Water Census.. In this data visualization, you can see how three major components of the water budget vary across the conterminous US. Precipitation is incoming rain and snow; evapotranspiration is outgoing evaporation from soil and water bodies and transpiration through plants; and runoff is excess water that makes its way to lakes and rivers through streams and spring discharges. 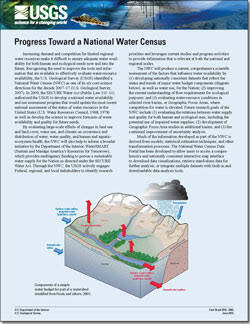 The National Water Census Data Portal contains national estimates of water budget components for local watersheds, water withdrawal data for counties, tools to calculate statistics of daily streamflow records, modeled daily streamflow at ungaged stations, and access to records of aquatic biology observations.